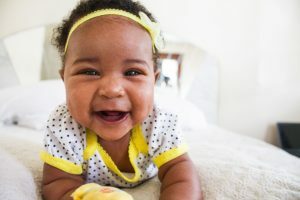 As a parent, bringing your baby outdoors can be a source of excitement since that means a series of firsts for your baby and moments of exploration with him/her. But it can also be a source of anxiety. Mosquitoes alone, hosts to Zika, dengue, and chikungunya virus, can be a threat. Then, there are other insects and dangerous animals to look out for as well. 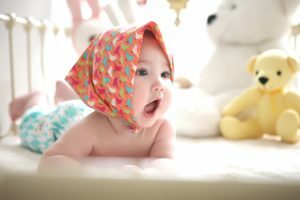 Aside from animals, you also have the wind and the sun that you need to protect your baby from. The Sunnec Large Baby Travel Tent is a product that addresses these valid concerns of parents who love the outdoors. And, it comes with a round drawstring bag with a radius of about 12 inches, as well as an English manual. It requires zero-assembly. All you need to do is take it out from the bag and carefully open it up. In under 15 seconds, it’s ready to use. It serves its purpose of keeping away insects like mosquitoes and dangerous animals such as snakes. It also protects your baby from the sun‘s harmful UV rays. 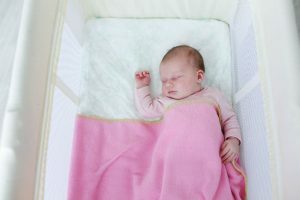 The see-through screen makes it breathable and allows you to check on your baby from the outside. It is lightweight and easy to carry around. It may fit in your tote bag along with other things. Very roomy. It takes years for your newborn baby to outgrow it. 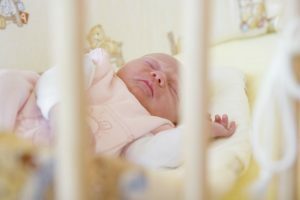 A child three years of age can still sleep in it but not move around as much though. It doesn’t come with a mat. The Sunnec Large Baby Travel Tent is a great product to protect your little one from harmful insects and animals and the sun. It will buy you some peace of mind while you and your family are out on a camping trip or beach escapade. 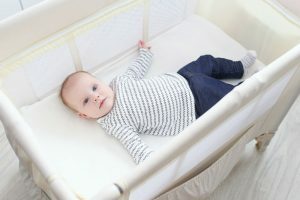 It is great even for home use, especially when you have to do some gardening around the house yet are wary of leaving your baby inside the house. As for portability and ease of assembly, this product gets it right. It’s a pop-up tent, so all you need to do is carefully open up this self-expanding screen tent. And to close and pack it, you need to follow only a few steps. Then, you end up with a round item that weighs only 14 ounces and that has a radius of 12 inches. It can easily fit in your bag. It would have been perfect though if it came with a mat like the kilofly Instant Pop Up Portable UPF 35+ Baby Travel Bed or SINOTOP Baby Travel Bed Crib that fits just right in the tent. Understandably, most tents do not come with a sleeping pad. But if you’d come to think of it, there’s a very thin line that differentiates one from the other. A matching mat would have been a welcome feature still. In terms of price, The Sunnec Large Baby Travel Tent falls on the average. 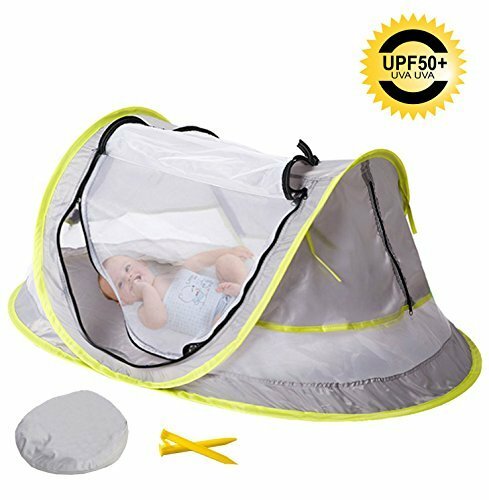 It’s cheaper compared to kilofly Baby Toddler (Large) Instant Pop Up UPF 35+ Travel Beach Tent; whereas, it’s just a little more expensive by a few dollars than SunFreeBaby Baby Beach Tent and kilofly Instant Pop Up Portable UPF 35+ Baby Travel Bed. The Sunnec Large Baby Travel Tent is a reasonably-priced item for a product that performs its job well. And since babies under 6 months old are not advised to use sunscreen, this offers a great sun protection alternative as well. It is great for family outings and just about any outdoor activity at home. It is also lightweight and compact that it can fit in any bag with a height and width of more than 12 inches. Don’t forget though to purchase a sleeping mat since it doesn’t come with one. Nevertheless, the Sunnec Large Baby Travel Tent offers a cheap price to pay for some peace of mind and real protection for your baby.